Making steady progress in its efforts to improve housing and living conditions for estate sector employees, the Plantations Human Development Trust (PHDT) announced the completion of housing and infrastructure development projects to the value of Rs. 2 Billion in 2018, as compared with Rs. 1.4 billion in 2017. Comprised of a tripartite coalition of Regional Plantation Companies (RPCs), Plantation Trade Unions (TU) and the Government of Sri Lanka (GOSL), the PHDT implements social development programmes to enhance the quality of life of the 210,000 families strong estate sector community. Over the course of last year, the PHDT working in close partnership with the RPCs and the Government oversaw the complete construction of 1,200 houses – with each unit being comprised of a living room area, two rooms, a verandah and a kitchen, together with a separate tiled bathroom provided with direct water supply and electricity connections for each house hold. By way of comparison, a total of 1,045 houses were handed over to estate sector residents in the previous year. Meanwhile, the percentage of the estate sector community living outside of line rooms increased to 20% while access to latrine facilities has been expanded from just 20% at the time of privatization to cover the entire community to 65% at present. “The challenge of providing adequate housing for the estate sector community remains formidable, however we believe it is vital to also acknowledge the tremendous progress that has been made in improving the quality of life of these communities. By highlighting positive changes, we encourage further progress by improving on livelihood development,” PHDT Director General, Lal Perera stated. He noted that in addition to providing housing and creating a sense of real ownership among beneficiaries, the PHDT also works in close partnership with RPCs to provide opportunities for livelihood enhancement, while providing training on home gardening and in household cash management in order to help estate communities to better plan their expenditure and encourage savings. Included in 2018’s housing projects were 405 disaster relief housing units, 150 owner driven housing and 50 pre-fabricated housing units the last of which was first commenced as a special project in 2017. 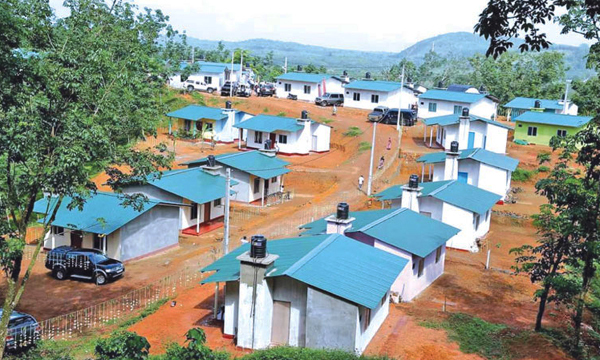 Meanwhile, Existing lines of houses in Galle, Ratnapura, Badulla, Kegalle, Kandy, Hatton and Nuwara Eliya were re-roofed as an interim measure until construction of new housing units are completed and delivered to residents. In total, the investment Rs. 25 million towards re-roofing of 600 units as part of a Rs. 80 million invested in special projects. Such projects were comprised of new water schemes, sanitation and hygiene (WASH) facilities, upgrading community halls, playgrounds, Early Childhood Development Centres and concrete roads in order to improve connectivity between estate communities and urban centers. During the year, PHDT and RPCs also worked in partnership with the World Bank under the Water Supply and Sanitation Improvement Project facilitating investments towards the replacement of public toilets with 300individual toilets provided to each worker while another 2,000 new toilets are approved for construction with a Rs. 80 million investment, offering a much-needed measure of convenience and improved sanitation conditions for estate residents. According to PHDT Director General Lal Perera such measures are considered vital in eradicating communicable diseases and improve on personal hygiene within the estate community – including communities situated downstream - while also reducing pollution of the environment and water resources, which are made safe for utilization for cooking and sanitation facilities. Child care is considered to be another key component of the programme in RPC Estates which is focused on addressing the needs of mothers and children. Under the 2018 Housing and Infrastructure project, 120 out of 338 Child development centres were upgraded in 7 regions at a project value of Rs. 400 million as at end 2018. Since its establishment 26 years ago, the PHDT and RPCs have facilitated the establishment of 550 water supply projects, and 25,000 sanitation projects while overseeing the construction of 175 km of estate roads and a further over 75,000 re-roofing units. Similarly, the PHDT and RPCs have also collaborated in completing construction of 938 child development centres and constructed 30,000 houses for estate sector communities.